Non-enveloped, head-tail structure. The icosahedral capsid is about 70 nm in diameter, with a T=9 icosahedral symmetry . 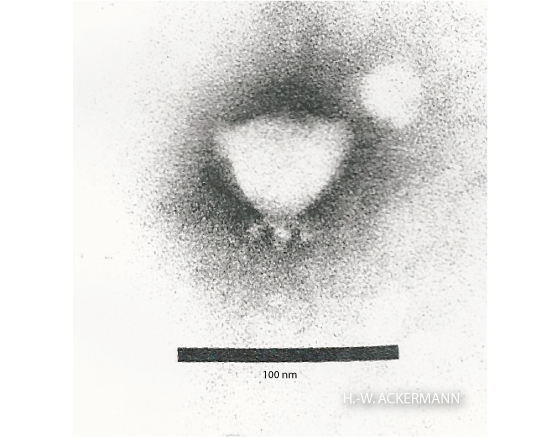 The virion contains about 4 copies of a viral RNA polymerase (vRNAP) . Linear, dsDNA genome of about 70 kb encoding 72 genes. Ejection of the viral DNA and the viral RNA polymerase (vRNAP) into host cell cytoplasm . 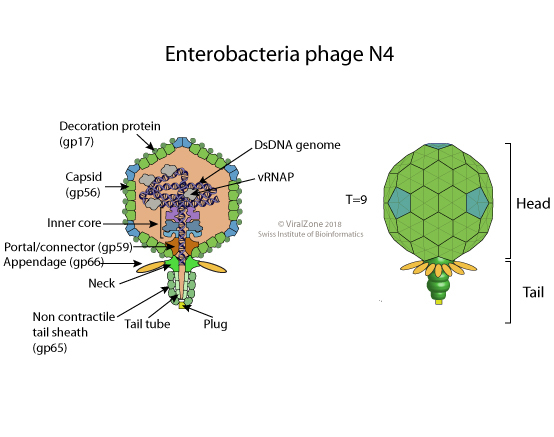 Transcription by the vRNAP of the phage early genes. Replication of genomic DNA. Transcription (by the host RNAP) and translation of late genes.